In RV salespeople we trust, but how reliable are they? 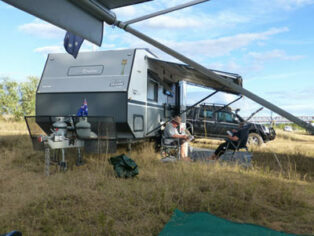 Ian and Jeanette found that not all salespeople knew as much as they should about caravans. As the number of horrific caravan accidents on our roads continues to climb, the search for ways to reduce the carnage grows ever more intense. While mandatory towing courses and greater driver education are seen as the obvious first step by many, some grey nomads think questions should also be asked of caravan manufacturers and caravan salespeople. They argue that, with some research showing around 70% of caravans on the road could be overweight, not all the blame can be put on the traveller who may not have been given all the relevant information when making an RV purchase. With criticisms levelled at the reliability of advice given by some salespeople, the Caravan Industry Association of Australia (CIAA) has announced it is to introduce a salespersons’ accreditation program in the next couple of months. Under the new initiative, salespersons in the program will be required to commit to be annually tested to maintain their accreditation. Former policeman Ian Earle who has been taking trips with his partner Jeanette since the ’70s, says regulation is long overdue. He says that, when visiting a camping show at Sandown Racecourse in Victoria recently, he was stunned by some of the things he heard. One salesperson told Ian that although the van he was selling was 3200kg, Ian’s Isuzu D Max (3-tonne tow capacity) would be fine to tow it. Despite his criticism of certain individuals, Ian is eager to acknowledge that some dealerships did have exceptional salespeople with very good knowledge of their goods. At the other end of the caravanning experience scale is David Mollard, a self-confessed novice who has been similarly frustrated by the lack of clear advice available. David, who has recently completed a towing course to boost his skillset, stresses that he is not suggesting that the individual is not ultimately responsible for their own van … only that they need to have access to accurate information. Do you think a salesperson accreditation system to ensure product knowledge – and reliability of advice – is overdue? Comment below. 18 Responses to In RV salespeople we trust, but how reliable are they? Fully agree l am purchasing a new van which will be available in March 2018 and requested the van be weighed before we pick it up. This will be my 5th van and it is being sold as Prado friendly. My last van was a 20ft van and weights were great for towing. The new van is 19.6″ with the tare weight slightly higher due to additional extras. This is why you need to know where your weights are at before loading. Its not keeping up to the speed limit thats causing accidents. Charley, I came up the Newell yesterday and had a delightful drive with the trucks , at 100kph , talking with the road trains to pass them. They are limited to 90 kph. Tug is 100 Series with van at 3 tonne. Trevor, agree 100%, that obstructing traffic by travelling too slow is a major cause of frustration to many road users and can lead to wrong decisions to overtake. Bert- ” speeding is the biggest problem” ??? I have witnessed several cans go over infront of me, and I can assure you they were not speeding. Correct weights of tug and van. Communicate with other road users, via UHF. Obtain the required skills to operate the combination safely. Drive to conditions- eg there are places on the Newell where speed must be reduced because of road surface damage. Also road conditions. Will ever travel the Newell Hwy again. A driver education video could be a great start towards safely towing a van.This could be documented upon regitration of the van for first step. We are talking about salesman. Most possess little or no credability. Also a large percentage of new caravan buyers have had little or no experience when it comes to towing a caravan hence the serious accidents. At the end of the day the onus is on the operator to check that his rig is safe and road worthy and manufacturers also need to concentrate on quality instead of units produced. The knowledge of the salesman is incidental as a lot of buyers do not have the technical knowledge to absorb the information that is thrown at them at time of purchase. Today sales will tell you anything you will swallow. The rubbish vans that are trying to get a slice of the market is unblievable. So you end up with shiny, all the gear and no idea! Paul Stevenson. The caravan buyer should at least be made aware that the weight stipulated does not inculde the weight of water when tanks are full.18 kgs of gas, and I believe in a lot of cases the awning or any other after market assesories that you decide to have fitted.They should be made aware how easy it is to add another couple of 100kgs.I have it from pretty reliable sourses that because of both stupid people and some sales people that they are going to bring in random scale checks and weight compliance checks and on par with the trucks ,big fines,also not being able to move from checkpoint until fixed etc,etc.. So as usual we all suffer because of a few that dont want to do right thing.Bring it on I say.I dont want someone charging towards me with a overweight out of control caravan.Cheers Stevo. Stick to 5-10 kms under the road limit or to road conditions. Check your mirrors regularly and if traffic is built up pull over when it’s safe to let them pass. Make sure you have a sway bar fitted regardless of how big or small your van is. Watch the road and drive to expect idiots to make mistakes. I have to agree, but it’s not just the sales person. If you have a newbie caravan buyer who knows Jack about safe caravaning talking to a sales person who’s poorly trained or whose last job was asking “Do you want some fries with that?” – well, then you have a perfect storm of ignorance. I do not yet own a caravan – that’s coming in May 18 – but when we were looking at vans we did all our homework first. So now, when I talk with a sales person and they start dribbling, my BS Detector goes off and we just walk away. I still have a lot to learn, so before we pick up our van, my wife and I will be doing a driving course. It’s simple – do your homework; at the end of the day, as the owner and driver, it’s my responsibility to know what I’m doing and what I’m getting myself into. Some of the above comments are about speed, the subject is about dishonest sales people, I don`t think honest/ dishonest sales people have anything to do with the way some people drive. In the good old days you were not allowed to tow anything that was heavier than the towing vehicle.Where’s that law gone?Also the height of some of these so called off road vans is crazy. The towing vehicle has nowhere near the ground clearance.Wake up ! Bring in a c/van towing license.